Japanese High School Baseball Federation announced that the 94th National Championship will be held at Koshien Stadium for 15 days from August 8, 2012. The final game on August 22, weather permitting, will start from 10:30 am instead in the afternoon until 2 years ago, not to affect already tight electric power supply in summer by additional huge power consumption of TV viewers throughout Japan. 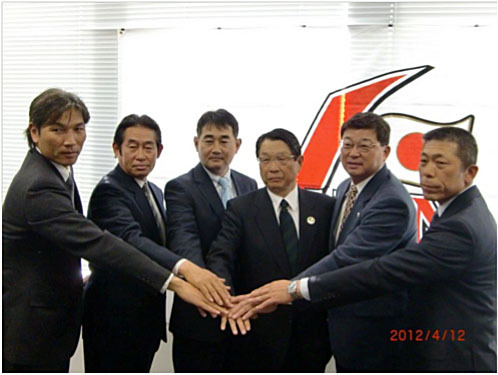 On April 12, the head coaches of forthcoming 2012 IBAF, BFA and FISU Championships gathered to pledge Gold Medals for Japan. Pictured from left: Shintani (IBAF Women’s), Katori (IBAF 15U in Chihuahua), Kojima (BFA Senior in Taiwan), Otagaki (BFJ), Kanemitsu (FISU WUBC in Taoyuan), and Ogura (IBAF 18U in Seoul).